Google SMS Search allowed users to search Google via text message. This worked by sending an SMS to a Google phone number that included the search query. Google then responded to the query with information, again via SMS and free of charge to the user. Many shortcuts were available to retrieve the latest sports scores, information about local businesses, stock information, translations or weather information using the SMS search option. The service has been useful for users who do not have a phone with a data plan, and users who can't or don't want to pay for Internet by the minute. 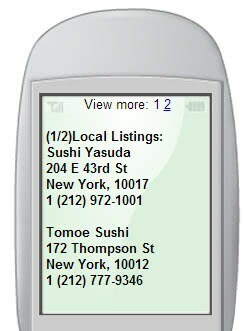 It has been one of the only ways for feature phone users to search the Internet while they are on the go as many feature phones come without web browser that they can use for that. It may have also been useful in other circumstances. When the phone was low on battery for example as sending an SMS message uses less battery power than firing up a web browser and browsing the Internet. The other SMS applications, Calendar SMS, Gmail SMS or Google Voice SMS appear to work just fine though. The Canadian SMS Search page is still up but since it displays the same SMS code, it is not working anymore as well. Note: 4Info is no longer available. Are there alternatives available that you can make use of instead? One option appears to be 4INFO even though it may not provide you with the same rich feature set that Google's offering provided you with. Load the website of the service and select one of the available options on the page, e.g. Weather, Eearthquakes, Horoscopes or MLB scores. You find all content listed here on this page. You have two options to use the service: first by configuring alerts that you receive via SMS daily or less frequently, and then by directly sending text messages to the 44636 phone number. The first option requires registration while the second does not. What a pity, I didn’t know about this feature and never used it. Is Google really so out of money that it has to shutdown so many services? Here is link below of one of google groups discussion. A google response offering NO details and generally, now ignoring the inquires & concerns from posters about sudden shut down of their SMS search. Google’s Shut Down of the Day. Gives the bloggers something to blog about and users something to complain about, but nobody does anything about it. Yeah! We should all raid google HQ and force them to reopen the services! What a bunch of idiots. It’s two words when used as a verb. (What’s the past tense? Hint: it’s not “shutdowned.”) The same is true of “backup,” “setup,” “login,” etc., but a lot of code monkeys forget how to write in English properly. Who was still using this? Wow man what a bummer, Google disappoints!